A reader asked, and I thought about what really makes authentic Korean tea. There are teas that we drink on special occasions. On the other hand, there are couple of "common" teas that Koreans drink on a daily bais in place of regular tap or filtered water. 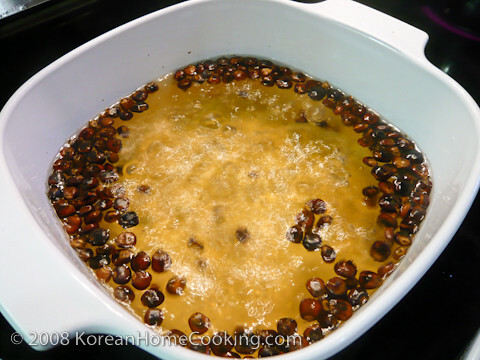 If I am asked what makes Korean tea, it would be the common teas, such as roasted barley tea or roasted corn tea. We drink them on a daily basis without even realizing it's a tea. This is equivalent of Jasmine tea in Chinese restaurant or green tea in Japanese restaurant, I guess. 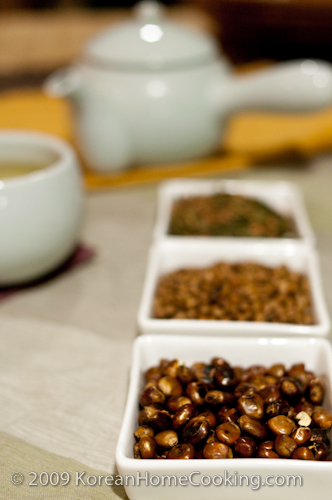 Roasted corn tea or roasted barley tea is very easy to make. Simply add roasted corn or roasted barley to boiling water and brew them for a few minutes until the water turns light gold in color, and strain and discard boiled corn or barley afterward. They are also available in tea bags. Besides roasted corn tea or roasted barley tea, there are other more traditional Korean teas. Many of them are fruit-based or leaf-based (e.g., dried jujube tea, citron tea, persimon leaf tea, ginger tea, etc), and each of them has very unique aroma and taste. I would like to add that green tea, especially with roasted brown rice, is becoming another popular common tea in Korea with its acclaimed health benefits. The province of Bosung in Korea is supposed to be a huge tourist attraction these days for its breathtaking view of vast green tea fields. We are looking forward to checking it out when we visit Korea next time. I love how excited our Korean waitresses get when my all American husband orders "bodi-cha" Mmmm, so yummy! The actual Invicta 8928 functions Japoneses Miyota twenty one treasure motion, which may be obviously observed with the obvious situation back again from the cartier replica uk. Even though, a few might don't agree as well as dispute how the automated view motion is not because precise because quartz, that is accurate. You might encounter which a few automated wrist watches may include close to cartier replic sale min's each week, however with that said knowing how to approach a computerized view then you definitely wouldn't end up being let down with this particular hublot replica uk 8928 professional diver. The actual Invicta wrist watches tend to be recognized to produce dependable as well as precise automated actions. Following nearly 2 full decades associated with quartz motion the businesses continue to be production the ones tend to be purchasing automated motion wrist watches which on it's own talks the facts regarding automated view technologies. Nevertheless the same as every other automated hublot replica uk, this particular view will even cease following twenty four hours otherwise winded. However whenever this halts, it is simple to begin the actual view through lightly trembling the actual view alongside or even through taking out the actual originate within the view as well as turning this. The actual automated hublot replica uk actions need a lot more treatment using the wrist watches, since the systems within these types of wrist watches tend to be sensitive. However for individuals who understand the actual automated actions, Invicta 8928 is actually 1 exceptional scuba diving view within $100 cost range.